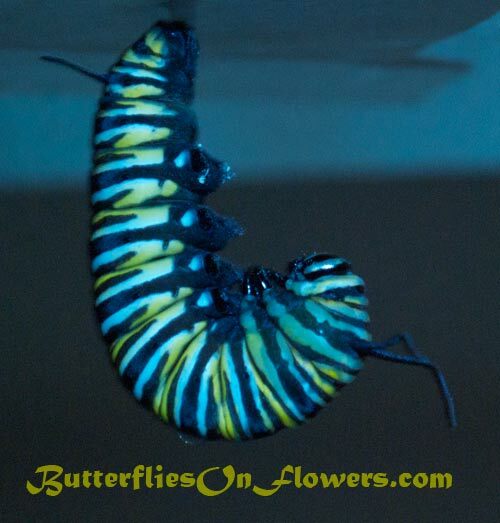 Caption: A Monarch Caterpillar hangs upside down as he contemplates Chrysalis transformation. This picture was taken on our kitchen ceiling. I line the top of my my caterpillar cage with small square pieces of paper. When a caterpillar attaches his back end to a square, I remove it and tape the paper with the hanging caterpillar on to the ceiling. This way it's easy to monitor the chrysalis so you'll know when the butterfly emerges...I've even witnessed a few hatchings sipping java at the breakfast table! Facts about Caterpillars: You can tell when a monarch larva is about to transform to a chrysalis because the head will show a greenish tint. This is the chrysalis underneath its skin!